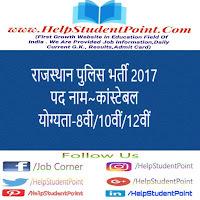 Rajashan Police Has Published Notification For The Recruitment Of Total 5390 Post . 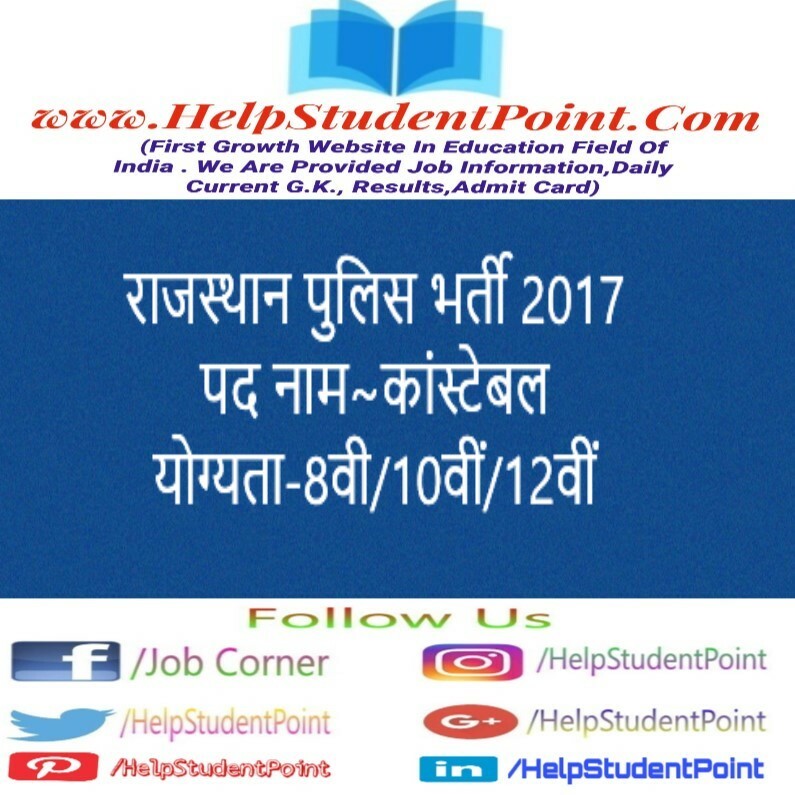 Interested Candidate May Check The Eligibility Criteria And Apply Online 23/10/2017 to 21/11/2017 ( now expend 25/12/2017) .and Other Details Like Important Date, Total Recruitment ,Recruitment Name, Name Of Organisation , Monthly Pay, Age Limit, Educational Qualification, Selection Process , How To Apply Application Form , Useful Tips, Official Notification And Official Website, Etc Are Given Below.You Can Ask Any Questions Related This Recruitment You Can Write Comments Box. Educational Qualification :-Candidates Must Have The Qualification Of 8th 10th 12th pass . More Full Details Check Official Notification Below Link. Selection Process :-Selection will be through online written exam . Then after Physical standard test and Physical efficiency test. Monthly Pay :-Candidates Will Get Monthly Payment Of Rs.5200/- To Rs.20200/- Plus. Note:- The Information Posted In This Recruitment Process Has Been Taken From The Official Website Of The Commission.This Post Information Is Correct But If Any Error Has Found, We Will Not Responsible For It.You Are Requested To Make An Overview Of The Employment Notice Issued By The Commission For Detailed Information In This Regard Before Applying. Sir my dob is 01.05.1991 in genaral ..Kia me driver me form fill kr sakta hu..
सर यदि में 29 वर्ष का हूँ तो में राजस्थान पॉलिश का फॉर्म भर सकता हूँ क्या?? What should be the minimum weight.